While enormously popular and pervasive, Pilates is also a uniquely individual practice. Pilates has something for everyone when delivered by the right instructor and practiced in the right environment. At Gold Line Pilates, we believe that Pilates is best experienced in a private and exclusive setting. We focus on you so you can focus on maximally enjoying the benefits of Pilates in your day-to-day life. Our approach to Pilates is highly tailored to your particular needs to achieve measurable results. 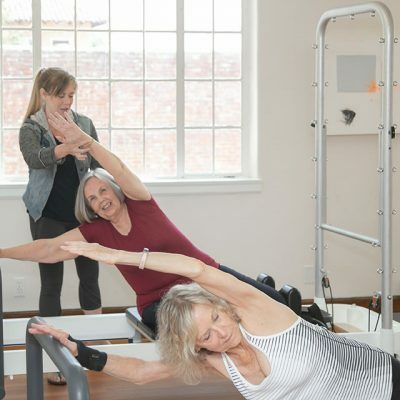 Gold Line Pilates provides all of our clients with individual assessments the first time they walk through our door, and every time thereafter. By assessing your current movement patterns, and understanding structural imbalances and asymmetries, our rigorously trained and highly experienced instructors create personalized workouts based on where you are today and where you want to be. • Sports performance enhancement (golf, baseball, tennis, cricket, triathlon). Ultimately, we want you to walk out of your session feeling better, more energized, happier and healthier.